Introducing EtherMagic™, an innovative Powerline Communication (PLC) System featuring Gigabit multipoint connectivity and PoE capabilities. EtherMagic instantly transforms your electrical circuit into a 1200 Mbps Ethernet network without the need to install Ethernet cabling. 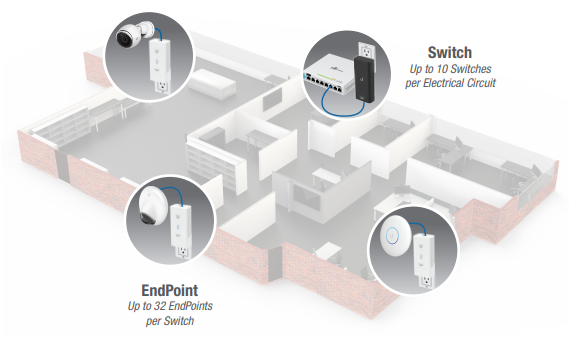 In the EtherMagic system, an intelligently designed multipoint Switch pairs with up to 32 EndPoints. Each EndPoint features built-in PoE, for much simpler installation than systems that require separate PoE adapters. Setup is quick and easy using the EtherMagic mobile app. EtherMagic is the ideal solution for networking wired devices in buildings where Ethernet cabling is unavailable or difficult to install. EtherMagic instantly transforms existing electrical wiring inside buildings into an EtherMagic network. EtherMagic creates a new range of possibilities by providing a cost-effective, wired network solution for older buildings where Ethernet cabling is unavailable or impractical to install. EtherMagic potentially saves tens of thousands of dollars in installation and cabling costs. Unlike PLC systems that are typically point-to-point bridges, EtherMagic systems are point-to-multipoint networks. The EtherMagic Switch works the magic by networking up to 32 EndPoints, and essentially operates and performs like a 32-port Gigabit Ethernet switch. The EtherMagic system offers amazing network scalability – perhaps only limited by the number of available outlets in the building. An EtherMagic network can support up to 320 EndPoints: up to 10 Switches on the same electrical circuit, and up to 32 EndPoints paired to each Switch. EtherMagic leverages HomePlug AV2* MIMO technology for robust PLC networking with speeds of up to 1200 Mbps. Rivaling wireless, EtherMagic significantly increases the reliability of high-bandwidth connections to all areas of the building. Video applications especially benefit from the advantages of EtherMagic by being physically connected to the network, and free from radio interference or Wi-Fi connectivity issues. 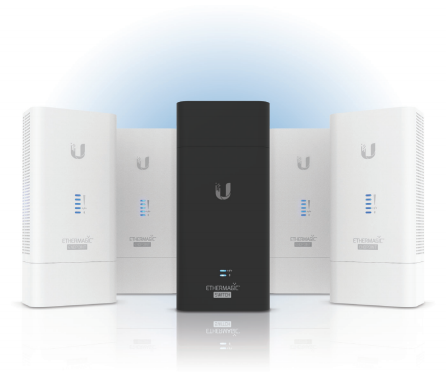 Download the Ubiquiti EtherMagic Datasheet (PDF).